Apart from Mr. Arkadin (1955), Macbeth is the film most cited as evidence for Welles’ “decline” following Citizen Kane (1941). Shot mostly on the sound stage of a studio associated with “B” westerns, Macbeth is either condemned by Shakespearean scholars furious at Welles’ irreverent treatment of the Bard or mourned by those lamenting the director’s post-Edenic expulsion from what they regard as “the genius of the Hollywood studio system” (1). Charles Higham and David Thomson savage the production. James Naremore defines it as a brave, but minor film, attempting to bring Shakespeare to a popular audience (2). 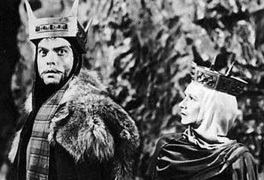 However, Macbeth is a dialectic appropriation of competing techniques representing Welles’ idiosyncratic take on Eisenstein’s cinema of collisions. Welles commented to Peter Bogdanovich, “I hate to be held down by what exists. I like to manufacture what I want.” (3) Macbeth is a collage of different styles and concepts. It formally resembles popular musical experiments, typified by punk and garage rock, which assault dominant conventions. It is more coherent than the fragmented, experimental nature of Othello (1952) (4), but it also employs a deliberate fusion of cinematic styles influenced by the paranoid nature of a postwar, nuclear world. Cocteau not only discerns the text’s post-apocalyptic nature but also comments that no single shot is left to chance (6). He also describes the actors haunting “the corridors of some dreamlike subway, an abandoned coal mine, and ruined cellars oozing with water” (7). His language appropriately evokes film noir’s dream connotations, especially noticing its rainy imagery now inhabiting interior space (8). Also, Cocteau’s reference to an abandoned coalmine anticipates the title of Adrian Martin’s significant study of Welles’ radio work (9). Many critics may have neglected this mine but Welles did not. As with his radio productions, he employed techniques of creative abbreviation to emphasise important concepts existing within any text he adapted to the screen. Macbeth is another version of his aborted Heart of Darkness project as well as another example of his weekly explorations into the evil lurking in mankind in his 1930s Shadow broadcasts. Like Citizen Kane, The Stranger (1946), The Lady from Shanghai, Othello, Mr. Arkadin, Touch of Evil (1958), and Chimes at Midnight (1966), Macbeth presents another grim picture of the dehumanising effects of power upon the human personality (10). Welles certainly reduces the complexities of Shakespeare. But his abbreviations emphasise a psychology of evil in which Welles’ Scotland becomes “an estranged version of Germany or that more abstract place, Fascism-land” (11). Despite its low status among Welles enthusiasts, Macbeth creatively uses sound and vision (12). Like Welles’ Harlem production (often referred to as “Voodoo” Macbeth), the witches dominate the action and appear at the end to pronounce, “The charm’s wound up”. Their power affects not just Macbeth but also Banquo’s heirs. After Macbeth’s death, Welles ironically cuts to Fleance as the crowd follows Macduff’s chant, “Hail Malcolm. King of Scotland”, suggesting that the new King’s reign will be as brief as his predecessor’s. The witches function as supernatural embodiments of power mechanisms affecting Macbeth. When they first depart, Macbeth dictates a letter to the Holy Father. As the camera tracks in to a mid-close-up, his speech changes to voiceover. Macbeth’s voice then gradually merges with that of Lady Macbeth so that they both speak as a chorus ironically echoing the witches. A lap-dissolve from Macbeth shows Lady Macbeth reading his letter. Her voiceover then accompanies the reference to “the dunnest smoke of hell” before the camera pans left to the swirling mist outside. It dissolves to an overhead shot of Macbeth riding on horseback to Dunsinane. Replacing theatrical soliloquies, these voiceovers cinematically embody murderous thoughts inhabiting dark environments. Drums punctuate the execution of the Thane of Cawdor evoking the earlier “Voodoo” Macbeth. Graphic set imagery, combining expressionism and Eisenstein, dominates the film. When we later see a drunken, crowned Macbeth, Jacques Ibert’s music parodies themes associated with Eisenstein’s favourite composer Sergei Prokofiev. Ibert also uses a zither to accompany Macbeth’s line, “poisoned chalice to our lips”. Before the porter scene, Welles has a shot evoking the future technique of 3-D. His bloodstained hands move towards the camera in soft focus while his body and background appear in sharp focus aptly complementing Shakespeare’s line, “multitudinous seas incarnadine”. Had the technology existed Welles would have anticipated that famous scene in the 3-D version of Hitchcock’s Dial M for Murder (1954) when Grace Kelly’s hand reaches towards the audience from the confinement of the screen. Where Kelly appeals for help from a voyeuristic audience, Welles implicates his viewers in Macbeth’s murderous deed. Welles also employs relevant cinematic devices to avoid redundant theatricality. The instrument in the famous dagger speech does not appear. Instead, influenced by Eisenstein’s montage of associations, an abrupt cut to a knife slicing the head of a voodoo doll introduces shadow images of a tormented hero. Rapid focus changes emphasise key lines in his speech, especially “art thou but a dagger of the mind, a false creation, proceeding from the heat-oppressed brain?” Melodramatic acoustic techniques occur as in the sound of the martlet frightening Lady Macbeth. Wind and thunder accompany the off-screen murder of Duncan. Cinematic references to Welles’ earlier films also appear in the use of long takes, the low-angle shot from the perspective of the murdered Duncan evoking Wilbur’s funeral in The Magnificent Ambersons (1942), and the oppressive cavern ceiling dominating a low-angle shot of Macbeth as he goes to the banquet in honour of the murdered Banquo. When Macbeth earlier invited Banquo, an off-screen cry of a baby ironically mocks his plans to establish his own dynasty. But perhaps the most audacious combination of cinema and theatre occurs in Macbeth’s visit to the witches. Macbeth rushes from his seat. The camera follows him to the top of a hill. Shadows of the Celtic cross and thorny trees appear in the background as he calls to the manifestations of his heart of darkness. Thunder pierces his cries. But this time the witches do not appear. Their disembodied voices penetrate the darkness as the camera slowly tracks in to an overhead close-up of Macbeth anticipating the opening shot of Othello. Macbeth is listening to what he wants to hear from the darkest corners of his mind. The film moves towards its climax like a deterministic film noir. As Macbeth performs the soliloquy “Tomorrow and tomorrow”, clouds gradually appear mocking any human thoughts of permanence. When the sequence concludes with the lines, “told by an idiot full of sound and fury signifying nothing”, a dark mid-close-up of Macbeth’s face fades into an image of Birnam Wood about to move against Dunsinane. Unlike Shakespeare’s original play, the witches appear during Macbeth’s confrontation with Macduff to mock his last hope as they did in the Harlem production. They eerily repeat Macduff’s line, “untimely ripped”. Malcolm’s victory ends in no tones of verbal reassurance. Enclosed by the dark realm of the night, Macbeth concludes ominously as the camera tracks away from the castle. The three witches watch from afar, shrouded in the mist which heralded their first appearance. As they utter the line, “Peace, the charm’s wound up”, the audience knows succeeding historical eras will confront more deadly charms. See Jonathan Rosenbaum, “Orson Welles as Ideological Challenge”, Movie Wars: How Hollywood and the Media Conspire to Limit What Films We Can See, Capella, Chicago, 2000, pp. 175-195. James Naremore, The Magic World of Orson Welles, Southern Methodist University Press, Dallas, 1989, p. 136. Orson Welles and Peter Bogdanovich, This is Orson Welles, ed. Jonathan Rosenbaum, Da Capo Press, New York, 1999, p. 248. Michael Anderegg, Orson Welles, Shakespeare and Popular Culture, Columbia University Press, New York, 1999, p. 101. Cocteau quoted in Welles and Bogdanovich, p. 204. Welles and Bogdanovich, p. 203. Anderegg cites the work of Jan Kott and Maurice Bessy who see certain postwar perceptions of Macbeth as being influenced by the Holocaust. “This is in many ways a postholocaust vision, a film fully conscious of the darkness at the center of the human soul, a darkness that Shakespeare, of course, had already understood, but a darkness that awaited twentieth-century totalitarianism for its full realization.” (p. 85) From 3 November to 17 December 1988, the Royal Exchange Theatre in Manchester staged Macbeth in the setting of a concentration camp featuring David Threlfall as Macbeth and Frances Barber as Lady Macbeth. Adrian Martin, “An Abandoned Mine: Notes on Orson Welles’ Radio Work”, Senses of Cinema 18, 2002. See Richard France, The Theatre of Orson Welles, Associated University Presses, New Jersey, 1977; Susan McCloskey, “Shakespeare, Orson Welles, and the ‘Voodoo’ Macbeth”, Shakespeare Quarterly vol. 36, no. 4, 1985, pp. 406-416. As Jonathan Rosenbaum points out in his Editor’s Notes to This is Orson Welles, Welles never regarded the Heart of Darkness project as abandoned but “still wanted to do it” (p. 512). For the relationship between his radio and theatre productions and the Heart of Darkness screenplay see Rosenbaum, “The Voice and the Eye: A Commentary on the ‘Heart of Darkness’ Script’”, Film Comment vol. 8, no. 4, July-August 1972, p. 28. Like the “Voodoo” Macbeth, Welles’ film version depicts a society torn between primitivism and civilisation. This explains the presence of Alan Napier’s Holy Father who never appears in the original play and who is, ironically, dispatched by Macbeth in the final scenes. Arthur Lindley, “Scotland Saved from History: Welles’s Macbeth and the Ahistoricism of Medieval Film”, Literature/Film Quarterly vol. 29, no. 2, 2001, p. 96. As I write this review in late November 2005, a poll among members of Wellesnet.com listing the director’s achievements has Macbeth in the bottom level of a 1 to 10 score.